The Luangwa Valley, which marks the end of the Great Rift Valley, is one of the last unspoiled wilderness areas and possibly the finest wildlife sanctuary in Africa. It covers an area of over 9000 sq. km. through which the meandering Luangwa River runs. The ox bow lagoons, woodland and plains of the valley host huge concentrations of game -including elephant, buffalo, leopard, lion, giraffe, hippo -and over 450 species of birds. 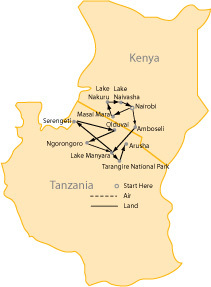 Malawi is a landlocked country, running down the end of the Great Rift Valley. Dominated by Lake Malawi, the third largest lake in Africa, the surrounding country is exceptionally beautiful with dramatic scenery that includes rocky outcrops, high mountains, plateaus and views across what is considered to be Africa's most beautiful lake. 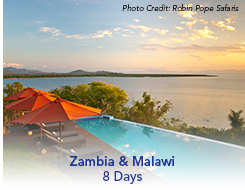 Malawi is known as the "Warm Heart of Africa" and as a people the Malawians live up to this name. They are extremely friendly and welcoming. There are many market scenes, road side stalls, cottage industries that a visitor can comfortably visit. With both the scenery and the culture Malawi is a great country to drive in. The ten bedded camp is situated opposite the Luangwa Wafwa (a game rich area of the park) in the Upper Lupande Game Management Area. It offers all the creature comforts of a lodge yet with all the intimacy, tailored activities and flexible mealtimes you come to expect from a bush camp. The camp is unique with its décor of locally crafted and handmade details. The main area is elevated between 1-3 metres on wooden decks affording great views to the park and river. The swimming pool is sunk into the deck, linked by a waterfall. Seating areas are all elevated and open plan with a bar area as well as a dining and reading area. Note: Nsefu is only open May 21 to Nov 21, outside of this period this itinerary will include 4 nights Luangwa River Camp. Pumulani is situated on the Westside of the Nankumba Peninsula in the South end of Lake Malawi - romantically called "The Lake of Stars". The ten villas are scattered around the hillside and are individual in shape and style but all have a spacious bedroom, bathroom and extensive sitting area. The front sliding doors open onto the deck - elevated above the ground giving optimal views. The central dinning and bar area is high above the lake with the most spectacular views and leads onto an expansive deck. The infinity swimming pool is on a lower terraced deck. The lake shore bar offers light snacks as well as refreshments. Meals will be served in the dining area, on the beach or by arrangement on your private deck. The stunning setting of the lodge and the unique comfort of the rooms means that many guests choose to make relaxation their main activity, but there is enough activities available to keep guests busy.